The new Moto 360... or not? If you were put off buying a Moto 360 because of the display resolution, you're in luck - it looks like version 2.0 of the device is going to feature a superior 360 x 360 pixel screen. The current edition of the Moto 360 sports a 320 x 290 display, with those extra 30 pixels representing the 'flat tyre' part of the screen where the graphics chip is housed. From the resolution report it sounds like the tyre look will be gone in its successor. We're basing this on device spec logs spotted by an app developer in the US and reported by Phandroid. The mystery piece of hardware has the codename 'Smelt' - that fish theme would fit with the original Moto 360's internal moniker Minnow. Other specifications reported by the device show that it's running Android Wear 5.1 and using an "armeabi-v7a" processor, which would seem to suggest ARM v7 CPU architecture inside. 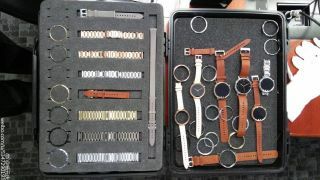 It's not the first hint we've had of a follow-up to Motorola's classy-looking wearable device: a couple of weeks ago we saw a case full of smartwatches that might well be new Moto 360s. We don't know much about a launch date or pricing, but we're expecting a choice of sizes and straps when the wearable eventually sees the light of day. The original Moto 360 is already over a year old so a successor is likely to be on the way soon.